Love Your Work; Then You Never Work a Day in Your Life! I liked AJ Draven from the moment I met him because I knew there was something pretty cool about him – even beyond our martial arts training. Being positive and self-motivated are keys to my kind of people. From there success follows. I met AJ when I began studying Krav Maga in West Los Angeles, in 2003. All my life I had studied Karate, Tae Kwon Do and Filipino martial arts, but was ready for more… AJ was one of the newer instructors on board at the Krav Maga Worldwide (KMW) Training Center, but his confidence was rock solid. I enjoyed his attitude; he could recognize talent and abilities in others, and he helped draw out the best in everyone. AJ walked peacefully, but upheld confidence. He was soft spoken, but when he speaks his choice of words are as tools that help shape lives and has especially helped his life become this incredible journey of organic happenings. Plus, he was committed to being his very best in martial arts. AJ had such a talent for inspiring others that KMW had him demonstrate numerous techniques at various events. I looked back on my training diary and it showed that AJ was one of my favorite teachers there. After I had been exposed to multiple instructors’ personality types in Krav Maga, and their teaching demeanors, I wrote in my training notes, “I hope AJ is back tomorrow!” He helped make learning Krav Maga more enjoyable and is one reason I still practice and teach it to this day. AJ said, “Yeah, that was pretty cool, I’d like for you to teach me some of that.” From there we began working on the side with stick fighting and Krav Maga! Through open-minded people and fellow artists who shared similar passions, I was exposed to many Hollywood figures. In Sherman Oaks, California, while training AJ and others in stick fighting, the film cast and crew of Blood and Bone came over to work stunt choreography. I was being watched and felt honored as actor Roger Yuan asked me if he could join my group. I said “Absolutely!” and we continued training throughout the day. It was great fun for me to be able to share my talents, and AJ loved every bit of it as well, as he has always had a passion for martial arts movies. Even while growing up Bruce Lee and Van Damme were his childhood heros, and AJ wanted to do what they did. All through his junior high and high school years AJ was stuck with a back brace and told he could never do extreme sports or maneuvers. He shares that wearing this brace everyday had humbled him and even motivated him to overcome it. After high school he grew into his back and began kickboxing, then made his way to LA and started Krav Maga training. He actually healed his back through martial arts and yoga. It allowed him to push forward and manage his body. He knew what he wanted – to work in martial arts and create martial arts movies. AJ knew that if you love what you do then you never work a day in your life! He shared that he believed in himself more than any other Hollywood executive would, so he just surrounded himself with the guru’s of the industry, partnered with people smarter than himself, went in the right direction with it all, believing in his team and went out and made it all happen – again, very organically. AJ made a name for himself already in Hollywood over the last several years. Currently featured in Special Ops as lead character Captain Kyle Fierson, AJ has another film coming out called Project Fear. Regularly featured on the Chiller TV Network with his other films, AJ expressed a desire to keep growing bigger, better and keep it thriving for years to come! Check out more about AJ, his films and upcoming projects on IMDb AJ Draven. AJ also started a non-profit organization, Angel City Pit Bulls, to build awareness of abuse and mistreatment of pit bulls and help to learn more about and appreciate the breed. AJ absolutely loves his animals BruceLee and Stanley (the “Lee brothers”, haha). You can help and learn more about this endeavor and heartfelt organization at angelcitypits.org. With big heart for martial arts, people, films, family and animals AJ is the right kind of people, and an example to my industry that I am very proud of. It is my desire to share his greatness with you in the hope that when you love what you do, you can make the most and best out of it, especially when you help so many others along the way. 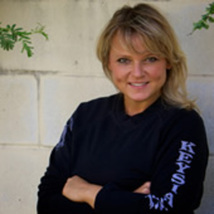 Master Renee Nolte can be reached at 979-661-1280 and universityofsidekicks.com. She is available for law enforcement and security training, as well as private and group training, either in Portland at Shamrock Fitness or in your neck of the woods.